English Summary/英文概要： From puddles to lakes, streams to rivers, and bogs to swamps, each body of water contains an amazing treasure chest of life. There is an abundance of plant and animal life hiding in every freshwater habitat. But freshwater habitats are also fragile and valuable resources that need to be protected and conserved. 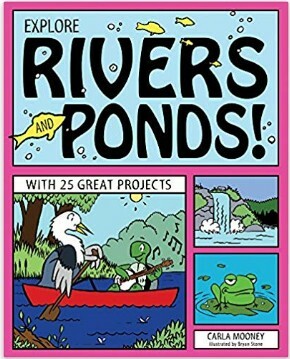 Explore Rivers and Ponds! with 25 Great Projects, introduces kids to the fascinating world of freshwater habitats and the creatures they contain. Combining hands-on activities with ecology and science, kids will have fun learning about the freshwater biome, including lakes and ponds, streams and rivers, and wetlands. Entertaining illustrations and fascinating sidebars illuminate the topic and bring it to life, while Words to Know highlighted and defined within the text reinforce new vocabulary. Projects include assembling an ecologist’s field kit, creating a fishless aquarium, pouring casts of animal tracks, and building a watershed replica. Additional materials include a glossary, and a list of current reference works, websites, museums, and science centers. Awards/获奖情况： School Library Journal "Fun yet informative line drawings elucidate an equally clear narrative, allowing readers to pool a reservoir of facts that can run close to home when website such as the EPA’s are offered with the suggestion that students can “figure out the path of water that flows from your school.”"
National Science Teachers Association Recommends (NSTA.org) ". . .an excellent addition for classroom and school libraries and as a resource for school and science fair projects."